The humanitarian emergency relief of the Chinese government's assistance for the flooded southern Laos was handed over to the Lao side on Monday in Lao capital Vientiane. The aid, carried by a Boeing-747 cargo plane of China Eastern Airlines, includes 100 boats, 500 tents and 100 water clarifiers. The relief handover ceremony was held at the airport apron of Vientiane Wattay International Airport. Wang Wentian, Chinese ambassador to Laos, said at the ceremony that China and Laos are good brothers who can go through thick and thin together, and whenever there is hardship, the two nations always share the same hardship, and support each other. The Chinese people are caring a lot about the situation of the Lao people in the disaster-stricken south. 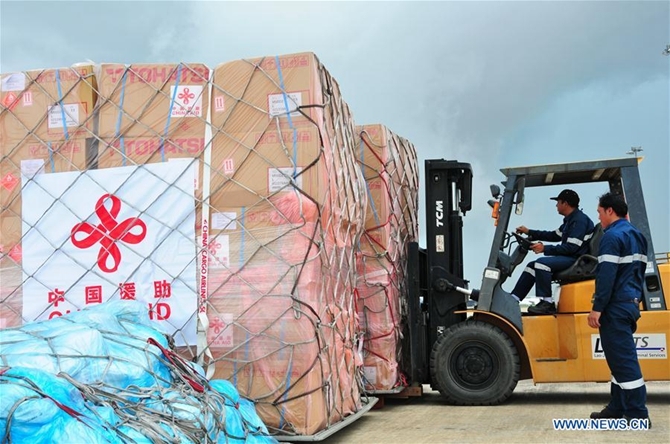 To assist the Lao government's efforts to rescue and help the affected people, the Chinese government has decided to immediately provide humanitarian aid to the Lao side, the Chinese ambassador said. "I hope that the relief, full of profound friendship from the Chinese people, will play a useful role in the Lao government's relief efforts," Wang said. In her speech delivered at the ceremony, Lao Deputy Minister for Labor and Social Welfare Baikham Khattiya thanked China for its selfless and generous assistance. After the floods in Attapeu Province in southern Laos broke out, China firstly offered Laos a helping hand, which once again reflects the sound friendship between the two governments and the two peoples, Baikham said, adding that the Lao side will make proper use of the Chinese relief supplies, to help the people in the disaster areas to resume normal production and living activities as soon as possible. On July 23, a saddle dam of the Xe-Pian Xe-Namnoy hydroelectric power project, invested by South Korean, Thai and Lao companies, burst, unleashing 5 billion cubic meters of water from the mountain to 13 villages of Sanamxay district downstream the Xe Pian River, some 560 km southeast of Vientiane. Six villages were almost submerged by the muddy flood with 13,000 villagers being affected. Till Monday, 11 people have been confirmed dead and 120 others remain missing in the dam collapse accident.